Cut the salmon into small cubes, place in food processor and hit only a few times. Do not over process, so that the salmon is in little chunks and not ground. Move the salmon into a bowl, mix well with the bread crumbs, beaten egg, shallots, lemon zest, garlic, 2 tablespoons of dill, paprika and season with salt and pepper to taste. Divide your seasoned salmon into 8 portions and shape them with the palm of your hand or hamburger mold. Cover them and refrigerate until you are ready to grill. Grill them over medium-high heat for 7-8 minutes on each side or until cooked thoroughly. Serve with cabbage and yogurt sauce. For the sauce, mix the cup of Greek yogurt with two tablespoons of dill, and if you like, 2 scallions and pinch of salt. If you prefer a spicy burger, add a dash or two of Tabasco sauce. You can replace salmon with crabmeat, and yogurt with mayonnaise. There is nothing tastier than a barbecue to celebrate summer dinners or reunions with family and friends. 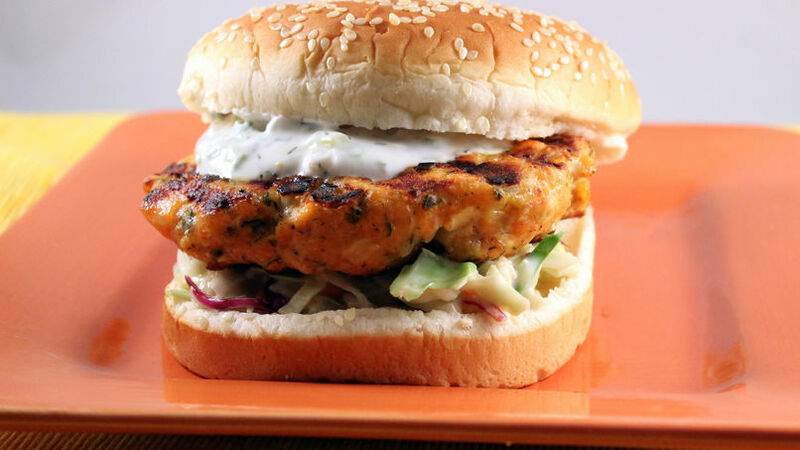 You can grill delicious meats, chicken or these salmon burgers that are the perfect alternative for those who prefer a light dinner. I tried them a few months ago at a seaside restaurant and, believe me, with each bite every ingredient is etched in my memory, not wanting to forget them. I tried them at home and this was the result.